Edwards Emerson Barnard (most commonly known as E.E. Barnard) was a prolific astronomer in the late 1800s and early 1900s. Among other accomplishments, he cataloged many dark nebulae, giving each of them a "B" number. B142 and B143 are two of these nebula, and how appropriate it is that the two nebulae appear to form a large "E" in the sky - just like astronomer Barnard's first two initials! The E formed by B142 and B143 is about 1 degree tall - equivalent to the diameter of 2 Full Moons. The nebulae are made of dust approximately 2,000 light years from us. 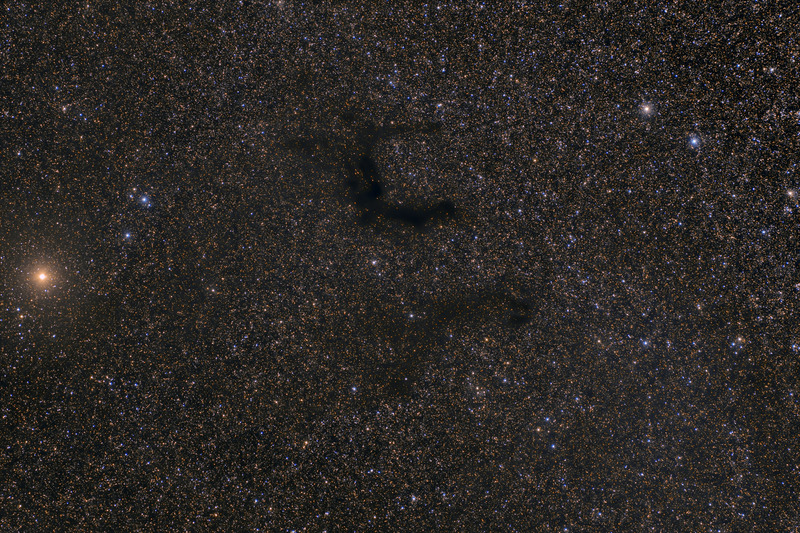 Behind the "E" is a dense field of Milky Way stars, and the dust from the nebula is seen in silhouette. The bright star on the left is Tarazed (Gamma Aquilae). It is a relatively young star of only 100 million years or so. The star is in a giant phase of its life where it is no longer burning hydrogen, but is burning helium and carbon instead. These "carbon stars" take on a characteristic deep red color. In this image, North is up. This image was cropped to 89% of the original full frame. Software Used Images Plus 6.0 for camera control, Images Plus 6.5 for calibration, stacking, color channel splitting and recombination, normalizing, ArcSinH stretching, star size reduction, edge masking, and masked stretching. Photoshop CS5 used for levels and curves, high pass filter, screen mask invert, lab color, saturation adjustments, selective color, and match color. Gradient Xterminator for gradient removal. Carboni Tools for additional noise reduction and smoothing. HLVG for additional color correction. Registar 64 for subexposure alignment, color channel alignment, mosaic normalizing. Notes Although capturing the data for this image wasn't particularly difficult, processing it proved somewhat different. Barnard's E is located in a very dense star field. Keeping the stars from overwhelming the field of view was rather challenging. Overall, I'm happy with the final result, as I think I ended up with some tight stars that show the nebulae rather well. This image was published by Astronomy Magazine as its Picture of the Day for December 27, 2018!